I was anxious to learn how to make a grape juice recipe. I love grape juice especially if it is made with concord grapes. I have always loved these grapes. When I was young, they were the only grapes that we ever had. 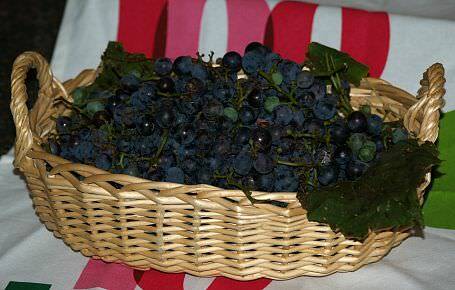 Concord grapes are dark blue in color and the flavor is so good. They make the best grape juice and preserves. My favorite way to drink this juice when I was a kid was a mixture of grape juice and 7-Up over ice. (This was only on special occasions when I could get a 7-Up). I am sure this is the type of grape used in Welch’s grape juice. I loved it as a kid but I found that the homemade grape juice is so much better. Making this juice at home allows you to add whatever you like to the juice. I prefer it without any additives; no sugar and no sweetener, just the delicious flavor of the grapes. When I learned how to make a grape juice recipe, I found that it not only offers a refreshing beverage but it is the bases for other recipes. I have made a delicious grape sauce and syrups which I use in desserts and over ice cream. The quickest way to obtain the juice for immediate consumption is with a manual or electric juice extractor. After extracting the juice, you may need to strain it through several layers of cheesecloth depending on your juicer. This process will remove the sediment which might be left causing a sharp taste due to the tartaric acid which comes from most grapes. Grape juice has enough acid that it can be canned with a boiling water bath rather than needing a pressure canner. For years, when I was young, the Concord grape juice recipe was the only kind I thought there was. We only had grapes at harvest time; late summer or early fall. I believe the Concord grape is the main one grown in Ohio. When they ripen, there are so many and they need to be used or preserved quickly. Many people would sort and wash them thoroughly, then cold pack the grapes in hot sterilized jars. They would either pour boiling water over the grapes in the jars or boil a syrup with sugar and water to pour over them. After this they would process the jars in a boiling water bath for about 30 minutes. Then the jars were stored and within a few weeks they had grape juice and canned grapes. I prefer the grape juice recipe where the grapes are cooked and strained before the processing. Place grapes in a stainless steel pot and only add enough water to simmer (about ½ cup for every 4 pounds of grapes); it doesn’t have to cover the grapes, only the bottom of the kettle. Cook over medium low heat at a simmer until the grapes are very soft; about 15 minutes. Strain the grapes through several layers of cheesecloth. Refrigerate juice for a couple of days and then strain again. Sediment will settle on the bottom. Heat the juice until hot but not boiling; at this point you can add sweetener if you like. If you do add sugar, stir until it is dissolved. Pour hot grape juice into hot sterilized jars leaving ¼ inch head space and adjust lids. Process jars in hot water bath for 30 minutes. 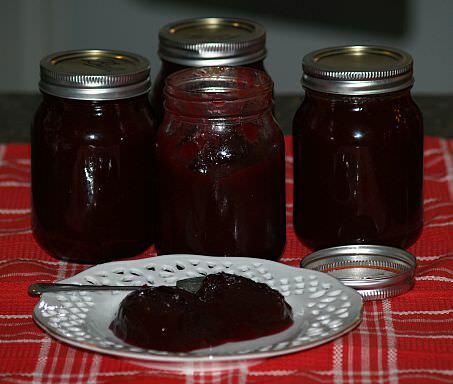 I love to make grape jelly from my fresh grape juice recipe. Actually mine is a “cross between” jelly and jam; so thick and flavorful. The first thing I do is prepare my pint jars; wash them in hot soapy water and rinse. Right before I cook the jelly, I place the jars in a kettle of boiling water to sterilize turning them upside down on a clean white towel to drain. I make sure my jar lids and rings are close at hand. After washing my Concord grapes thoroughly I drain off all the water. Place them in a large stainless steel pot and add about ½ cup of water. Heat the mixture stirring until all the grapes are thoroughly heated. When they are hot and steaming, mash them down with a hand potato masher and SET OFF the heat. Remove the jelly from the heat and quickly skim off the foam. Working quickly I throw my jar lids in hot water and fill the sterilized jars leaving 1/8 inch headspace with boiling hot jelly, wipe the rim with a clean towel, place a hot lid and ring on the jar. Invert the jars about 30 seconds and then turn upright to cool. Fill one jar and adjust the cap before doing another; a helper comes in handy for this. Remove rings about 12 hours after canning; if center of dome is down and stays down the jars are sealed. JELLY STAGE: Although a thermometer is very useful in making jelly, it is also advisable to do a test with a spoon because sometimes the temperature will vary in different areas. The jelly stage usually runs about 8F degrees above water boiling in your area. To do a spoon test dip a large metal spoon into boiling syrup, tilt the spoon until the syrup runs from the side. When the jellying point is reached, the syrup will not flow in a stream but will divide into distinct drops. I was asking HOW TO MAKE GRAPE JUICE to different friends and here are two more ways that they sent to me. Put 1 ½ pints of grapes in a hot sterilized ½ gallon jar. Boil 1 ½ cups of sugar in enough water to fill the jar until sugar dissolves. Pour sugar syrup over the grapes and seal tightly; store. After 4 to 6 weeks the juice can be poured off the grapes; drink or reprocess in boiling water bath. Sort and wash grapes; place in kettle and barely cover with water. Boil until seeds are free; strain and measure juice. Bring juice to a boil and add ½ cup sugar to each quart of juice; boil 5 minutes. Combine all ingredients and blend well; place container in freezer for about 1 ½ hours before serving. Place all ingredients in a blender; blend on high until smooth and pour into a large glass. This is a refreshing grape juice recipe. Combine and blend; pour over block of ice in punch bowl. NOTE: If preparing in advance, add ginger ale and club soda right before serving.